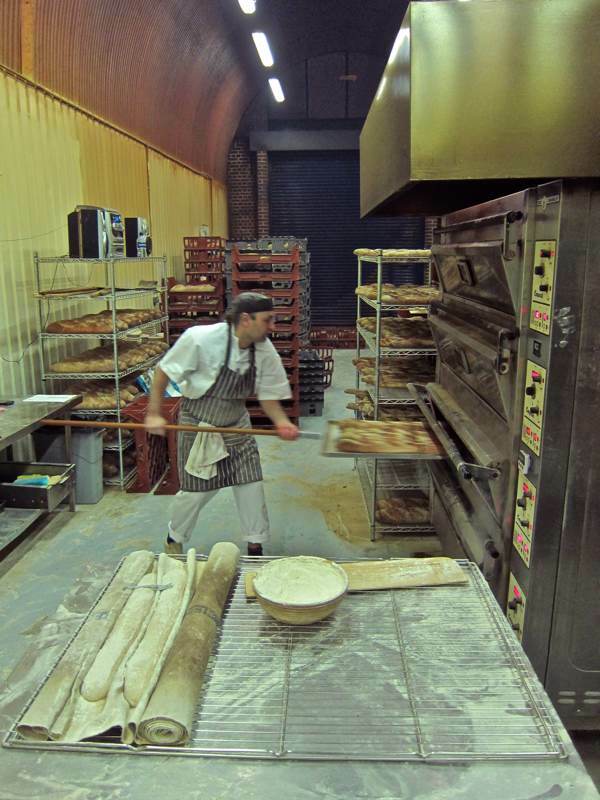 Three years ago, I spent a night in the bakery at St John, recounting the nocturnal activities of Justin Piers Gellatly and his fellow bakers, making the delicious bread which became so integral to the success of St John that they named their Spitalfields restaurant St John Bread & Wine. 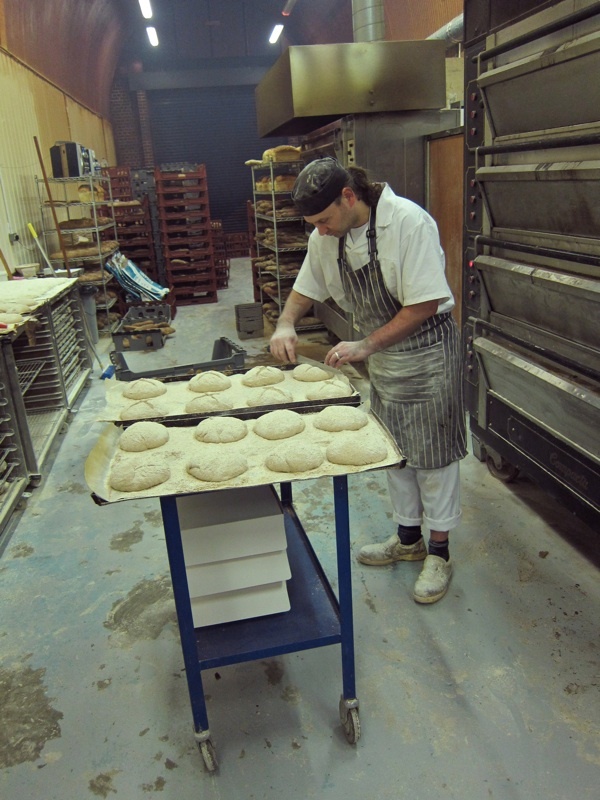 In those days, Justin used to take over the kitchen in Commercial St at night to do his baking, but as demand for his bread grew he moved to his own bakery under a railway arch in Druid St, south of the river, where production quadrupled as the bakers worked in shifts twenty-two hours a day, seven days a week. At the same time, the word spread of Justin’s heroic prowess in the creation of eccles cakes, mince pies, hot cross buns and especially doughnuts, turning the railway arch into a popular destination on Saturday mornings as hundreds of hungry south Londoners converged at the bakery, intent upon carrying off trophies while they were still warm from the oven. 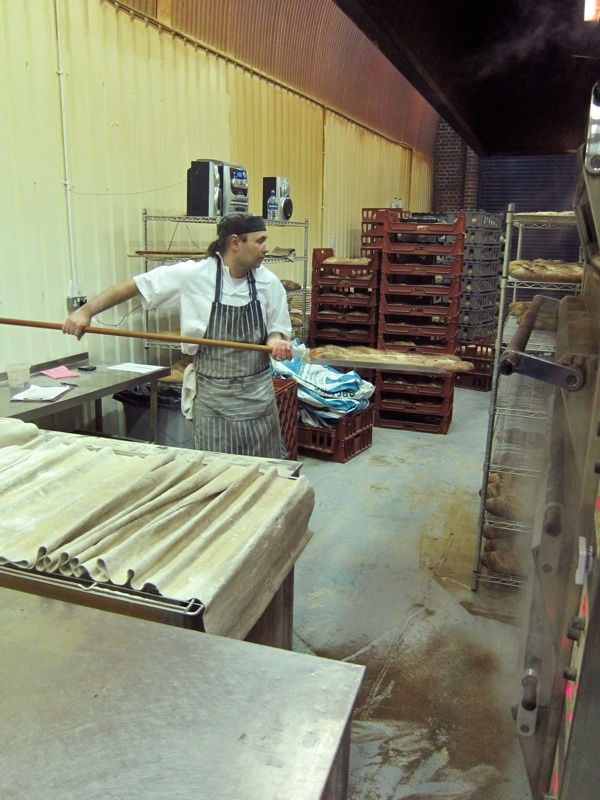 Yet, just as all good things must come to an end, Justin left the bakery last week. 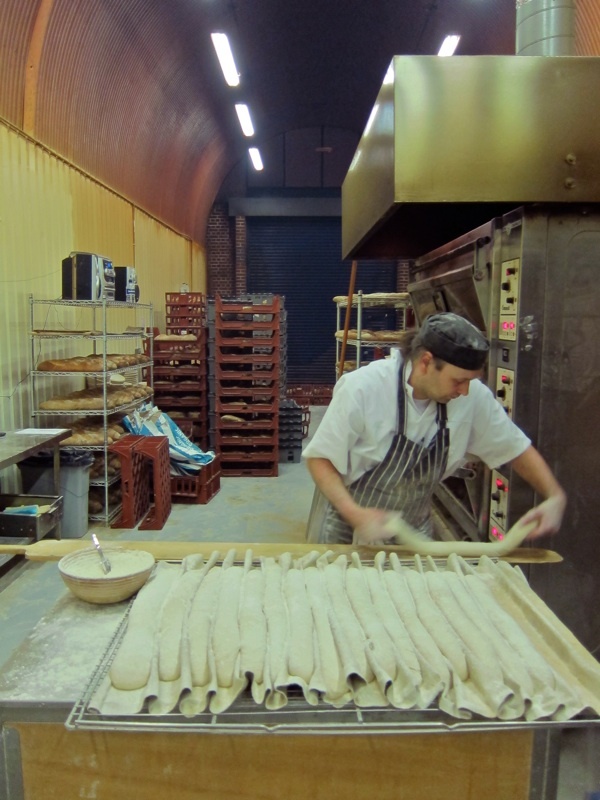 So I returned to share his last night among the ovens, recording the moment for posterity and celebrating his catalogue of achievement in baking over the last thirteen years at St John. You might think that such success would compromise Justin in some way, but what I discovered was that during the small hours he checked every single one of the thousand loaves he baked that night to ensure they met his approval and then he did all his own cleaning up too, carrying sacks of flour around and making up all the orders as well. “It’s quite emotional tonight,” he admitted to me with a crooked smile when I arrived around ten to the seeming chaos of the steamy bakery, where Justin stood surrounded by hundreds of loaves proving. Further into the recesses of the arch, beneath the golden barrelled vault, Luka Mokliak was producing the vast quantities of dough required and at the far end Mariusz Korczak was making the cakes. 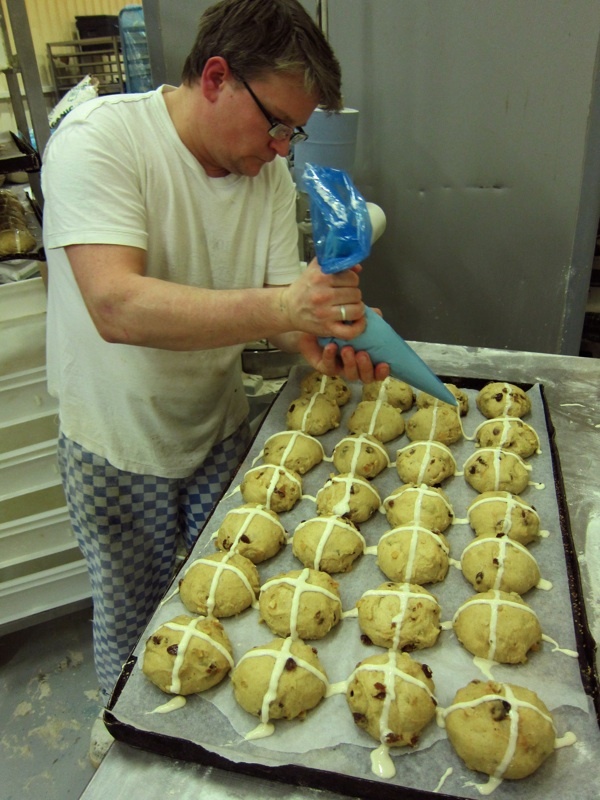 The warm humid air was fragrant with the commingled aromas of sour dough, hot cross buns and doughnuts. 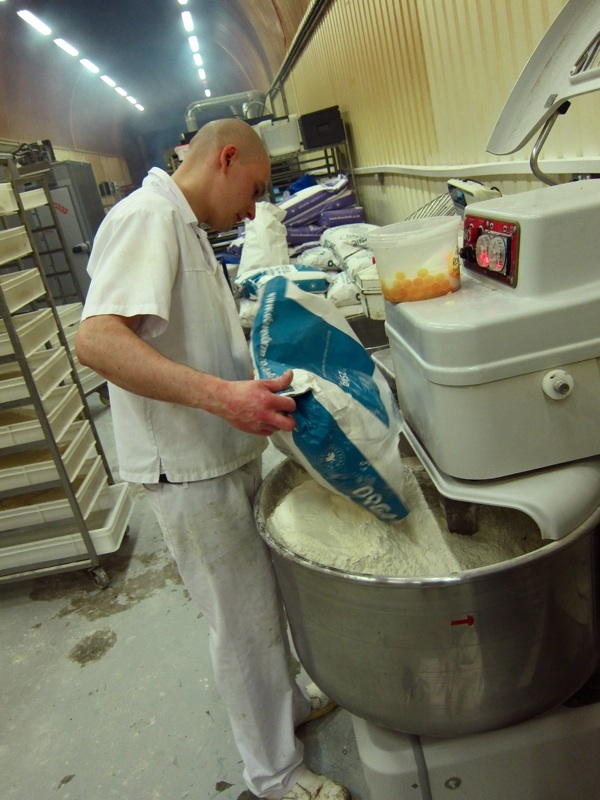 “It doesn’t feel like it’s ending, it seems like I’ll be back tomorrow,” Justin declared over his shoulder, as he tossed flour onto a table of loaves and set to work furiously, scoring them and delivering them into the oven just as he removed others that were baked. It made complete sense, since the wonder of Justin’s baking is that it is like superlative home baking without any of the compromises of commercial production. 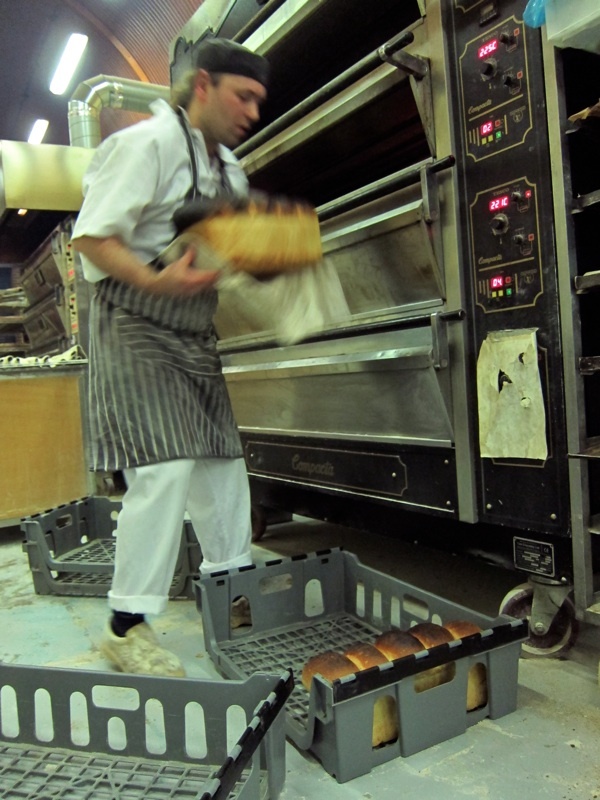 Watching Justin manage the process of baking a thousand loaves to perfection, I realised what a complex task it was to pull it off at this volume. 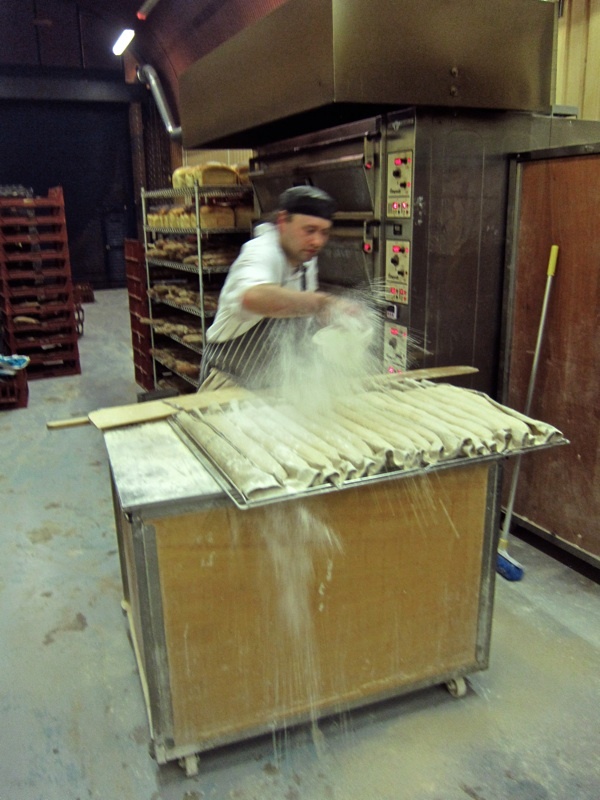 Over the years, he perfected juggling all the variables, so that the loaves went not just into the oven but into his mind too and he held them there, paying attention to every mutable aspect, the seasonal qualities of the flour, even the effects of changing air pressure and moisture in the atmosphere. It was a virtuoso act of mental and physical dexterity all at once. The hours had flown away and a stack of a thousand loaves had grown between the ovens and the door. It was an epic night’s work for one man, a daily miracle of Biblical proportions. Justin worked placidly as he had done through all the years until the moment came to take out the last loaves and shut down the ovens. 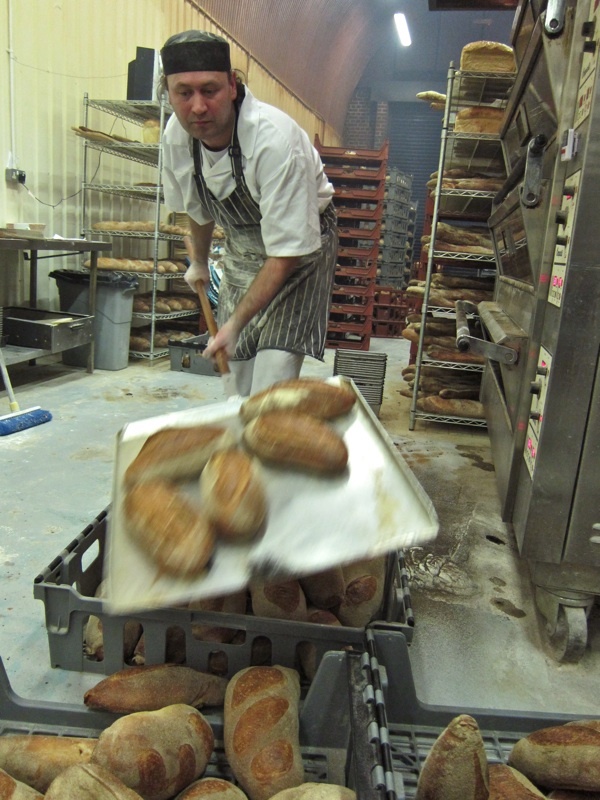 He lifted out the shovel of rye sourdough and tipped it down, so that the loaves fell into the basket with finality. “That’s the end of the show!” he said quietly, almost to himself and in disbelief at his own words. Yet you may be assured Justin leaves a team of bakers that he trained who will continue his work faithfully. 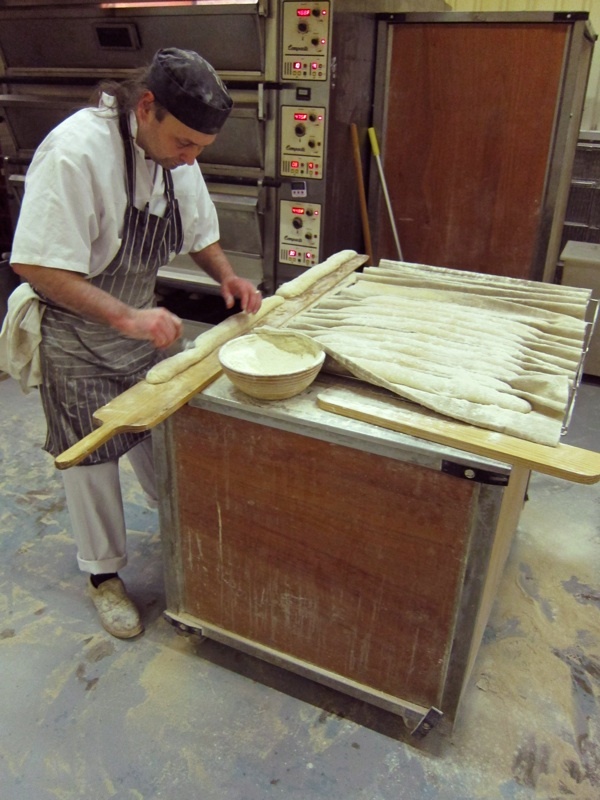 Justin places baguettes upon the ‘peal’ ready to go in the oven. 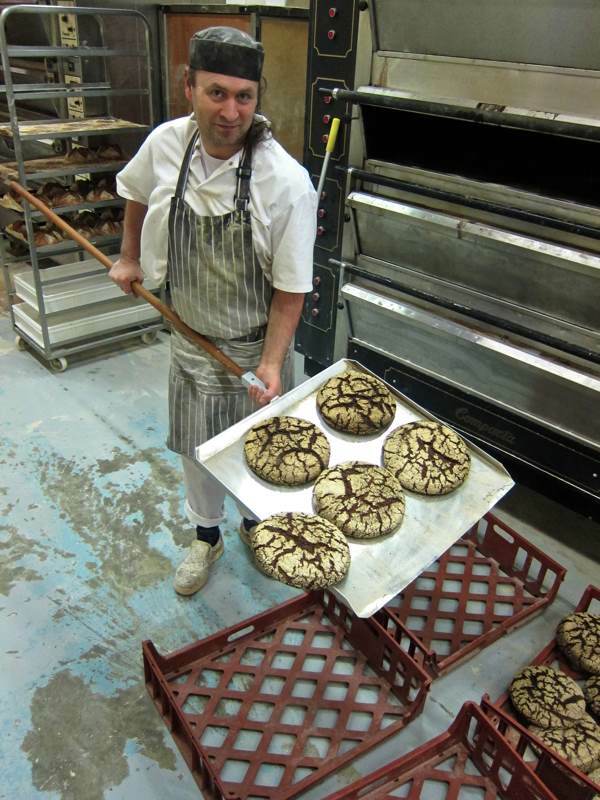 Mariusz Korczak crosses the buns. A moment of preoccupied calculation. Luka & Justin make soda bread. 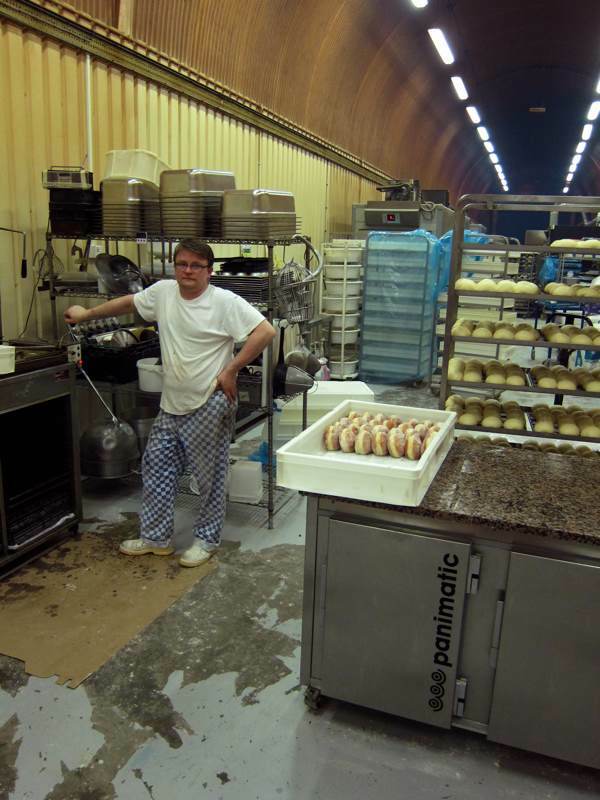 Mariusz waits for the doughnuts to fry. 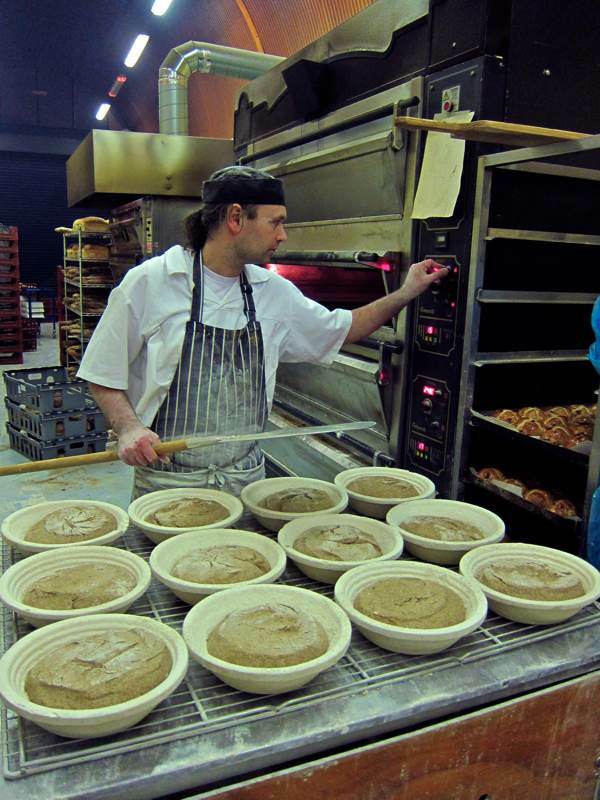 Justin prepares to put his last loaves in the oven. 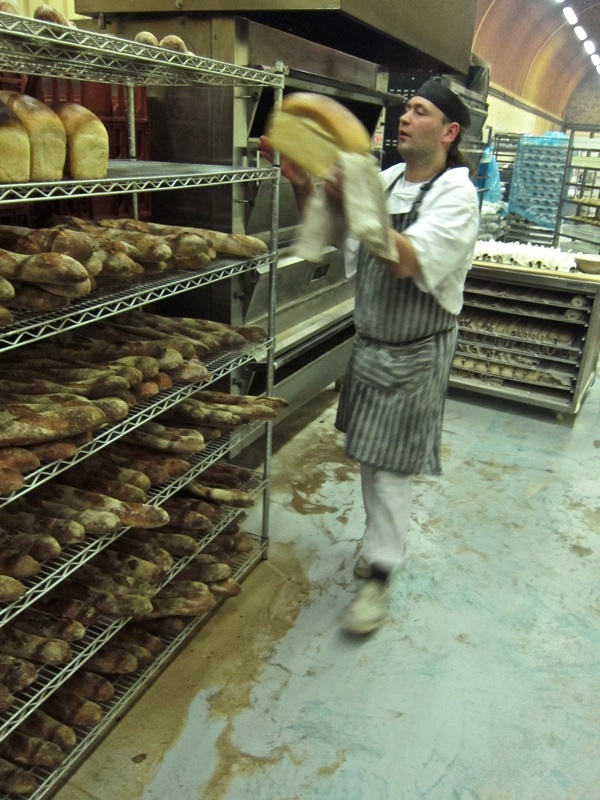 “That’s the end of the show!” - Justin’s last loaves come out of the oven. 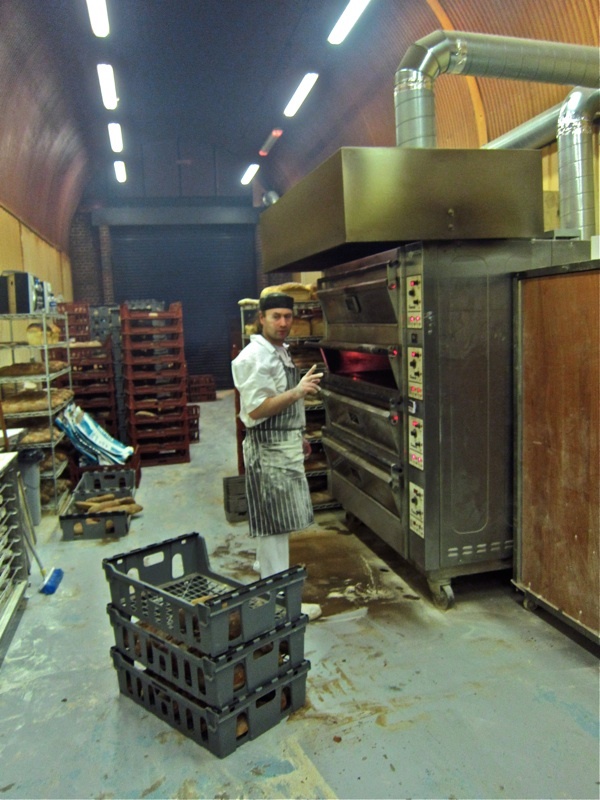 I also bake my own, but occasionally buy “St Joh’s” stuff as well – it is really good, as you say. 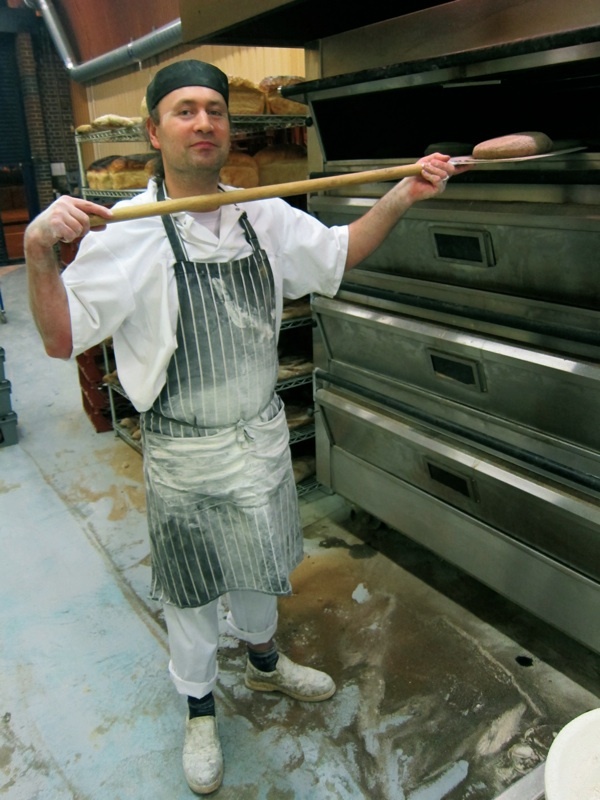 Well done Justin, a true Master Baker making good bread in an age which supplies so much adulterated rubbish. Come back to baking soon. Scary title. ‘Last Night…? !’ Cliff hanger till almost the end of the words. 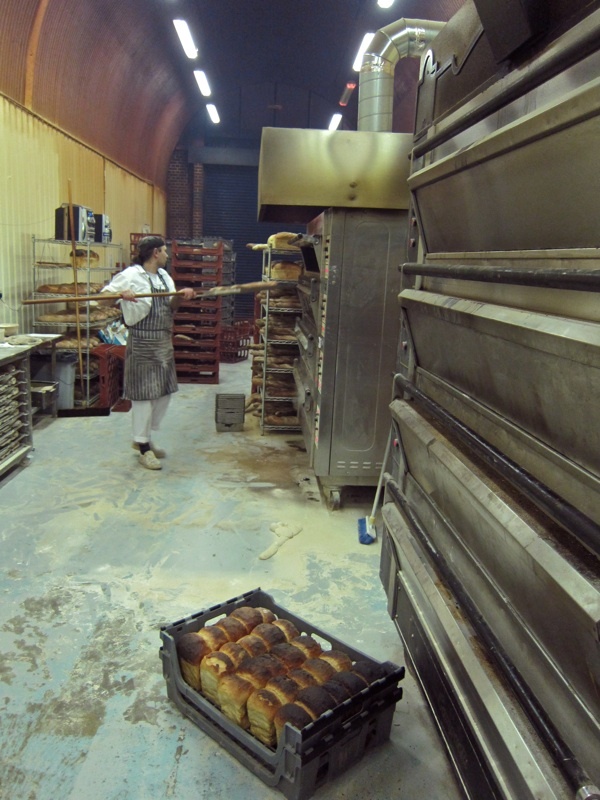 Phew: a team of bakers that Justin trained will carry on. Excellent photographs as always by that Spitalfields Life contributing photographer – The Gentle Author. the historian huizinga specialized in endings, having realized that we too often cherry pick history for the origins of things happening now. we think that the origins of things happening now is what life was like in the middle ages, for example. huizinga proved things ended in the middle ages as well, and life then was not just the foreshadowing of umbra sumus. thank you for the end of this story. love to justin and his sister. I am so glad the others will be able to carry on, people deserve proper bread, not that mass produced chewing gummy stuff sold in supermarkets. My husband bakes 3 loaves a week (hand done, not in a bread maker). It is wonderful with home made soup! 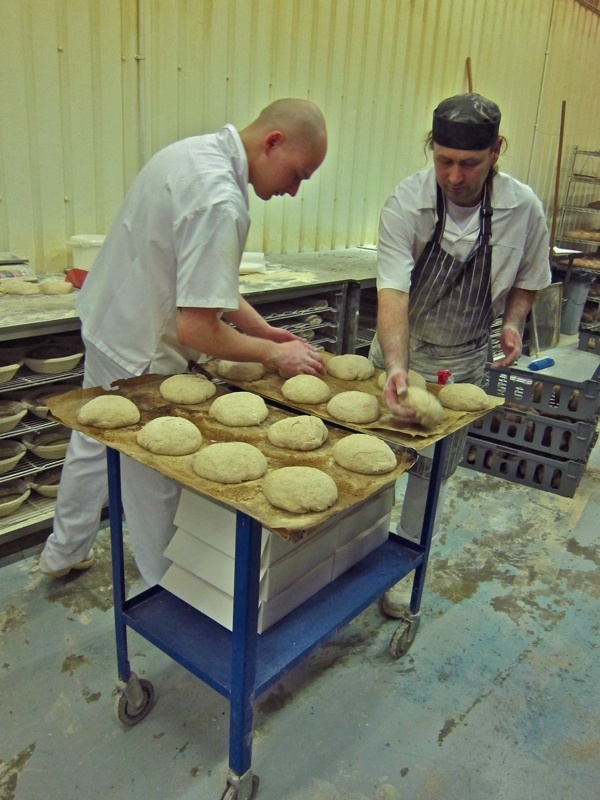 ‘The bread singing’ – a poet baker! What a great website. I’ve just spent hours reading on here. I found the attempted arson of Freedom Press sad but inspiring as well. And of course I loved this post, makes me want to go bake some bread. But it is also about following your passions to do something you really enjoy.